A radiant body of work lies in the shadow cast by the Hungarian poet Attila Jozsef's tragic suicide at 32. 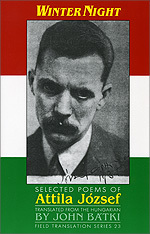 In pure song-like lyrics and longer elegiac poems Jozsef inscribed not only his sad fate but that of millions in an Eastern Europe that was only nominally "between the wars" during the '20s and '30s of the last century. "Jozsef's words are shock therapy for the new millennium: angry, sad, hopeful, mystic, holy, epic, heroic, humble, disturbed." "Batki has done a superb job: the translations demonstrate again and again just how contemporary Jozsef's work remains." and roll it completely smooth. and to the smallest village huts. though one is as good as the other. Copyright c 1997 by John Batki and Oberlin College.